This Lowepro camera bag review is based on our personal experience of Lowepro products. We own a Lowepro Rover AW II camera bag, which we bought prior to going on a full year around the world trip in 2006. We needed a good camera bag to store safely our expensive Canon DSLR camera equipment, including extra lens and flash. Being discrete and not easily identifiable as camera backpack was also important to us as part of our travel safety precautions. Though we bought this bag as part of our long travel around the world, we have since used it every time we go travelling, hiking or simply for a day out at the beach. In addition to the Rover AW II bag, we also own a small Lowepro camera case for our compact camera, which we can attach to our Lowepro DSLR camera bag (simple but useful feature of the Lowepro products). We also own Lowepro Rezo TLZ 20 camera bag, which is great if we are only taking our DSLR camera with us. We use it to protect our camera when we want to carry it on our shoulder for extended period, i.e. even if we have the backpack with us. We have used all our Lowepro Camera Bags extensively since we got them and both are holding up extremely well. We are very pleased with our Lowepro bags and feel comfortable recommending the Lowepro brand. Why Do We Like Lowepro? There are so many reasons why we “lowe” our Lowepro camera bag. The Lowepro Rover AW II looks just like any other backpack. This is important, as we do not want to draw unwanted attention to the fact that we are carrying valuable camera equipment when travelling. 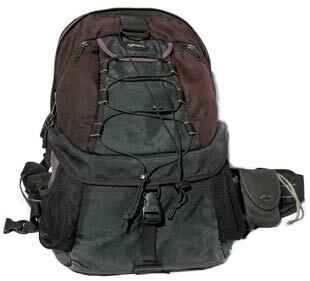 It is a backpack, which means easy to carry, which is always great when out exploring or travelling between places. It is also very comfortable to carry. The straps are padded and easily adjustable. There are waist straps as well, distributing the weight of the bag more evenly. The bag is divided into two parts. The bottom part is for the camera and lenses, while the top part is great for other gear and personal belongings. Actually, the divider between the two parts is removable so we can easily change our Lowepro camera bag into a normal backpack. Yet another innovative feature of Lowepro products. The bottom section is amply padded to protect our camera gear. It comes with adjustable padded dividers, allowing us to customize the space for our gear. This keeps our camera gear save and organized. We use the upper part for all other gear. When we are out hiking, we use it for snack and extra layers of clothes. When we are flying, we use it for our travel documents and books to read on the plane. There are number of zipped pockets, on the inside and outside. You can also store various items on the outside of the back. There are two mesh pockets suitable for water bottles or any other items you want to have easy access to (like our dogs' leads). You can also attach various other Lowepro products to the Lowepro DSLR camera bag. We for example carry our Lowepro compact camera case on the waistband, making it easily accessible. The tripod holder is great, giving us no excuse not to bring one because it attaches easily onto the bag. We also use the straps to attach our outerwear to the backpack. The built in all weather cover protects the bag from the elements and has been extremely useful on so many occasions. It is tucked under the bottom of the bag, so when you need to protect your bag from rain, you simply pull it over the bag to rain prove it. It is such an easy but clever solution. Our Lowepro DSLR camera bag did take a lot of beating on our around the world trip and did not fail us once. It spent one week camping deep inside the Amazon jungle, endured 4 day motorbike ride on dusty roads in Laos (the famous Loop), got up close and personal with the fabulous Sossusvlei sand dunes in Namibia, got hot and sweaty in the Australian outback... just to mention few of our adventures with our Lowepro DSLR camera bag. The outer fabric is water resistant and usually it is enough just to wipe it clean with wet cloth. However, during our world tour, extra measures were needed... so our Lowepro camera bag had few showers with us and it looked like new afterwards! We have to share some photos of our Lowepro camera bag from its tour around the world with us. It often had grueling time with water, sand, and lot of dust thrown at it. It never failed, proved to be perfect travel companion and it did not mind being washed several times during our yearlong journey. Would We Buy Lowepro Bag Again? Absolutely, though we expect our Lowepro DSLR camera bag to last us for many more years. We are however thinking about adding to our Lowepro “family”. Our Lowepro Rover AW II is great for days out, hiking and exploring. In addition, it is useful to own a seperate smaller DSLR camera bag for urban use, something small and discreet, but still big enough to carry some extra camera gear and personal belongings, something like the Lowepro Classified shoulder camera bag. Lowepro does not sell directly on-line but Amazon features almost all of their product range and they offer very competitive prices and delivery options. Amazon consistently offers the best prices for Lowepro Camera Bags. There are many options as there are so many great Lowepro Camera Bags available. We recommend watching the Lowepro product videos; they will give you an excellent idea of what Lowepro bags “can do”. We actually learned couple of things about our Lowepro DSLR camera bag that we did not know before! Ps. if you are using your camera bag in any kind of wet conditions, then you should opt for Waterproof Camera Bag.